This t-shirt shows it once again that being original is so much more fun then following the crowds. On this t-shirt you can see rain clouds and all seem to be in a bad mood and dropping the rain down except one that cloud seems so happy and maybe it’s because it makes the rain drops go up instead of down. You can get this fun rainy t-shirt in royal blue like the picture or in different colors and yes it is available in special cuts for men and women in sizes ranging from Small to 6XL. 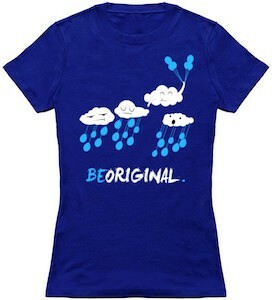 Star being different and start by wearing this Rainy Be Original T-Shirt.